New Tech Wood > Blog > Blog > Can you work with composites the same way you work with timber? Can you work with composites the same way you work with timber? In short, yes. You will be able to work with WPC (Wood Plastic Composite) decking in much the same way you work with timber: cutting, drilling, screwing and even bending boards. The one thing you won’t be doing is using your nail gun. Many composites, like NewTechWood for example, are manufactured from a percentage of recycled timber, as well as plastic. With NewTechWood, the ratio is 60% recycled timber and 40% recycled plastic, which means the product essentially is half timber and amenable to being worked on with traditional carpentry tools. The plastic used in many composites is Polyethylene, which has a density of 930 kg/m^3. Timber, on the other hand, has a wide variety of densities ranging from 400 to 1200 kg/m^3, so as far as cutting goes, sawing composite would be like sawing a harder- than- average piece of timber. Because of this we recommend using saw blades with 60-62 teeth. If you are installing the boards in areas exposed to a lot of water, i.e. around a pool or jetty, we recommend sealing any exposed or cut ends with a sealant. If using NewTechWood, the sealant we recommend in Australia is Crommelin’s Wetlook Paving Sealer. The boards will contract lengthways about 1mm per lineal metre depending on temperature. For NewTechWood, the full contraction and expansion table is presented in the installation guidelines. 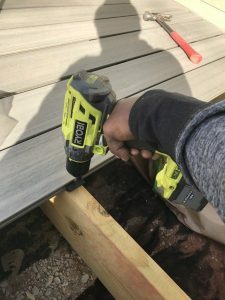 Attention must be paid to these values when installing the decking, which is why the hidden fastener system is so important, because these hidden clips are designed to allow for the expansion and contraction of the boards. For a modern, clean look NewTechWood provide a secret fix system where the clips are hidden in the gaps between the boards. The clip slides into the grooved edge of the board and is screwed into the joist. NewTechWood Australia provides the choice of two (2) different gap spacings between the boards – 5.5mm or the Mini-Gap 1mm spacing. A 5.5mm gap is the standard for most decks in Australia. The Mini-Gap Clip system is perfect for commercial installations where public safety may be an issue. 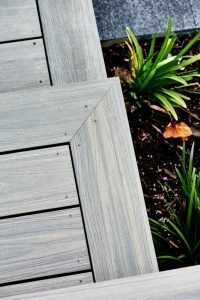 The smaller gap protects against high heels becoming lodged in the gap, and also prevents leaves or tree nuts from getting stuck between the boards. The maximum joist spans may change between brands of composite decking. Always check the installation guides before installing the sub-frame to ensure there are enough joists for the decking chosen. You can fix composites to a timber or metal frame and this requires particular screws for both applications – timber fix for timber joists, and metal fix for metal joists. Also, you must use screws that are specially designed for composite material. You can install the decking on traditional timber or metal joists, or you can use a system like Nivo Pedestals. NIVO Adjustable Pedestals provide a clever solution for architects and builders when designing and constructing raised flooring. head composite screws should be used, for either timber or metal fix, to match the colours of the boards. Top fixing, or face fixing, is recommended only for fixing breaker boards, picture framing and fascias, and then you must pre-drill and counter-sink every hole slightly larger than the screw (approximately half a millimetre) to allow the boards room for expansion and contraction. Also, when screwing boards, don’t screw any closer than 20mm or less from the edge of the board. Can you glue composite boards in place? No. EXCEPTION: To adhere small bits of decking, for example around posts, where it is not practical to top fix or use clips, we recommend using an adhesive that will ‘move’ when the boards contract/expand. In Australia, we recommend Sikaflex. Can you lay the boards directly onto the ground or over existing paving? 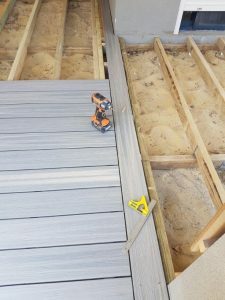 No matter which Composite decking brand you choose, it is imperative that you check the Installation Guidelines for the product before you start. For NewTechWood, installers and Do-It-Yourselfers can download a free copy of the Installation Guidelines from our website.